Halloumi /həˈluːmi/ (Greek: χαλλούμι) or hellim (Turkish) (from Arabic: حلوم‎‎ ḥallūm [ħalˈluːm]) is a Cypriot semi-hard, unripened brined cheese made from a mixture of goat's and sheep's milk, and sometimes also cow's milk. It has a high melting point and so can easily be fried or grilled. Halloumi is set with rennet and is unusual in that no acid or acid-producing bacterium is used in its preparation. Halloumi is popular in the Levant, Greece, and Turkey. Demand in the United Kingdom had surpassed every other European country, except Cyprus, by 2013. Halloumi cheese originated in Cyprus in the Medieval Byzantine period (AD 395 – 1191), and was subsequently eaten throughout the Middle East. The cheese is white, with a distinctive layered texture, similar to mozzarella and has a salty flavour. It is stored in its natural juices with salt-water and can keep for up to a year if frozen below −18 °C (0 °F) and defrosted to +4 °C (39 °F) before sale. It is often garnished with mint, a practice based in the belief that halloumi keeps better and stays fresher and more flavoursome when wrapped with mint leaves. 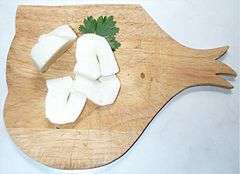 In accordance with this tradition, many packages of halloumi contain fragments of mint leaves on the surface of the cheese. The cheese is often used in cooking and can be fried until brown without melting, owing to its higher-than-normal melting point. This makes it an excellent cheese for frying or grilling (like for saganaki) or fried and served with vegetables, or as an ingredient in salads. Cypriots like eating halloumi with watermelon in the warm months, and as halloumi and lountza, a combination of halloumi cheese and either a slice of smoked pork, or a soft lamb sausage. Halloumi is registered as a protected Cypriot product within the United States (since the 1990s) but not yet in the European Union. The delay in registering the name halloumi with the EU has been largely due to a conflict between dairy producers and sheep and goat farmers as to whether registered halloumi may contain cow’s milk, and how much. Most Cypriots agree that, traditionally, halloumi was made from sheep and goat milk, since there were few cows on the island until they were brought over by the British in the 20th century. But as demand grew, industrial cheese-makers began using more of the cheaper and more-plentiful cow's milk. Halloumi is regularly consumed in many parts of the Middle East such as Lebanon, Turkey, Syria, Palestine, Jordan, Israel, Egypt and Iraq. In most of the Arab states, the cheese is called halloum and it is served with meze. It is a traditional component of the Arab breakfast, eaten either fresh or fried, along with other Arab dishes such as hummus, falafel, and khubz. Halloumi cheese is very similar to Nablusi cheese, named after Nablus, Palestine, its city of origin. Some believe that Halloumi cheese is Arab and of Levantine creation, due to its similarity to Nablusi cheese and the region's long history of consuming Halloumi cheese. In Israel, it is called by its Greek name. 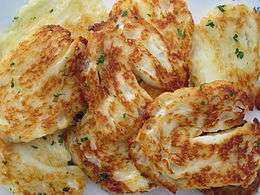 Halloumi in Israel is sometimes fried in olive oil and served for breakfast and served with meze. It is also eaten with fish. The name "halloumi" is derived from the Egyptian Arabic, itself a loanword from Coptic halum 'cheese', referring to a cheese that was eaten in medieval Egypt. In modern Egypt, hâlûmi is similar to Cypriot "halloumi" but is essentially a different cheese, is eaten either fresh or brined and spiced. ↑ "European Commission - PRESS RELEASES - Press release - Cyprus 'Χαλλουμι' (Halloumi)/'Hellim' cheese set to receive Protected Designation of Origin status". Retrieved 3 January 2016. ↑ Gibbs, Paul; Morphitou, Ria; Savva, George (2004). "Halloumi: exporting to retain traditional food products". British Food Journal. 106 (7): 569–576. doi:10.1108/00070700410545755. ↑ Ayto, John (1990). The glutton's glossary: a dictionary of food and drink terms. Routledge. p. 133. ISBN 0-415-02647-4. Haloumi, or halumi, is a mild salty Cypriot cheese made from goat's, ewe's, or cow's milk. ↑ Lazarou, Stalo. "Χαλλούμι". foodmuseum.cs.ucy.ac.cy (in Greek). Cyprus Food Virtual Museum. Retrieved 30 November 2015. ↑ Charles O'Connor. Traditional Cheesemaking Manual. International Livestock Centre for Africa. ↑ Allen, Gary J. (2007). The herbalist in the kitchen. University of Illinois Press. p. 212. ISBN 0-252-03162-8. Haloumi (sometimes spelled Halloumi) is a brine-cured cheese from Greece and Cyprus containing chopped mint. ↑ Cooke, Nicholas (22 September 2013). "How halloumi took over the UK". BBC News. Retrieved 2013-09-23. ↑ Galarneau, Andrew Z (2008-09-14). "Elements: Halloumi -One ingredient, one dish". The Buffalo News. Retrieved 2008-09-15. ↑ Saoulli, Alexia (March 3, 2007). "Halloumi bickering threatens EU application". Cyprus Mail. Archived from the original on 2007-08-13. Retrieved 2007-03-04. ↑ "Tesco Halloumi 250G". Teso. Retrieved 2016-04-23.